Amateur Radio volunteers in the Philippines activated emergency nets on HF and VHF as Typhoon Hagupit -- called Typhoon Ruby locally -- raked slowly across the islands, weakening as it went. "As Typhoon Hagupit entered its third day, ham operators continued to provide essential traffic as the storm progressed through Philippine territory," reported Philippine Amateur Radio Association (PARA) Chief Operating Officer Thelma Pascua, DU1IVT. Members of the Ham Emergency Radio Operations (HERO) -- the PARA equivalent of the US Amateur Radio Emergency Service (ARES) -- were active. More here. The US Department of Homeland Security's 2014 National Emergency Communications Plan (NECP) has incorporated Amateur Radio in its mix of media that could support and sustain communications in a disaster or emergency. The NECP is "the nation's over-arching strategic plan for enhancing emergency communications capabilities and interoperability nationwide," DHS said in announcing the updated plan on November 12. "[A]mateur radio operators...can be important conduits for relaying information to response agencies and personnel when other forms of communications have failed or have been disrupted," the NECP states. More here. The Army and Air Force branches of the Military Auxiliary Radio System (MARS) merged their long-distance radio networks in late October for a 48-hour Department of Defense-sponsored contingency communications exercise. The plan also called for MARS members -- using their Amateur Radio call signs and operating on amateur frequencies -- to establish two-way communication with ARES leadership or members in as many US counties as possible. More here. The exercise commenced with the start-up of the group's SKYWARN weather net on one of the repeaters (147.165 MHz). NCS Bob Burns, W9BU, made periodic announcements to the effect that should the repeater fail, the net would resume on the ARES repeater (147.015 MHz). Efficiency was tested when this scenario was almost immediately put into effect: All 13 participants switched over to the ARES repeater and the full ice storm scenario was commenced. While the ARES repeater and net were humming along, it was announced that should this repeater fail, simplex operation and designated channels would serve as the primary communications conduit. Then, pursuant to the plan, the repeater did go down due to a "blown fuse in the power supply." The 13 participating hams had to switch radio frequencies again, channels varying according to where they were located for effective coverage. The group now turned to depending on the pigs for continuance of communications coverage and exercise success. Use of the pigs picked up where the repeater left off, allowing for cross band and single band simplex operation. They worked and all SET participants finished the exercise. This year several specific tests were conducted successfully. For example, the ERN stations (three in total) are situated around the county for the purpose of supplying operators with different capabilities. One of these stations is placed inside a pole barn that is located near Danville atop one of the highest ground elevations in the county. Another station is located at the Hendricks County Communications Center in Plainfield, and the third station will soon be located at the water works facility near a radio tower in the town of Brownsburg. Currently these stations are made up of antenna and coax only. The radio is installed at the site only during an actual emergency or disaster - kind of "plug and play"). SET participants used simplex radio tests previously at two of these locations showing ARES leaders would be able to reach over 90% of hams with HT's only, in the county. This exercise proved that statistic again. region on the morning of December 13 on 7262 kHz. The purpose was to test the pathways for that band (40-meters) and time between operators from Maine, New Hampshire, and bordering Canadian provinces. The exercise was a result of Maine Emergency Management Agency Communications Manager Steve Mallory's suggestion that Maine hams put extra effort into training and drilling with neighboring states and provinces, since disasters do not recognize borders. Maine ARES Section Emergency Coordinator Phil Duggan, N1EP, was net control and had 33 stations from New Brunswick, Nova Scotia, New Hampshire, Massachusetts, Rhode Island, and Vermont check into the net. Several state/provincial ARES and other emergency coordinators participated, as did New Hampshire SEC Wayne Santos, N1CKM. On November 3-6, 2014, the members and operators of Utah's Sinbad Desert Amateur Radio Club (SDARC) participated in a wilderness-based rescue training exercise in conjunction with the Emery County Sheriff's Office Rope Rescue Team, Emery County Search and Rescue Rope Team, Black Dragon Rescue Systems and National Guard Civil Support Teams (CST) from New Mexico, Colorado, Idaho and Oklahoma. 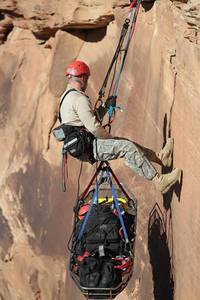 The training took place among the high red rocks and deep canyons of Utah's picturesque San Rafael desert in eastern Utah. The exercise consisted of multiple medical emergency rescues, from one of the many canyons that are favored by climbers and hikers alike. The 300-foot vertical medical rescues were exciting to watch. Emery County Sheriff's Office brought their emergency response vehicles to the desert deep canyon site, which included the recent addition of their Amateur Radio/Public Safety Communications trailer. All on scene communications by Public Safety and the Military were run on VHF hi-band frequencies, and supplementary communications for the event were handled by members of the Emery County ARES group who are all members of the SDARC. Amateur contacts were handled on 40 meters and 2 meters using the SDARC's extensive 2 meter repeater system, and 2 meter simplex, and HF contacts were made to the State of Utah Department of Public Safety EOC at the State capitol. Logs were maintained of all communications between the National Guard CSTs and Emery County rescuers. Special thanks went out to all members of the SDARC who spent many hours working the radios and logging during the exercise, modifying the trailer and installing the communications equipment. Exercise organizers and evaluators stated that communications during this exercise were the best they have ever been for any of their exercises in this type of remote location and that the Sinbad Desert Amateur Radio Club is a valuable asset to Emery County and the State of Utah. A matter of language to consider: the difference between an emergency and a disaster. IMHO, these words are not interchangeable. So, what's the difference? An emergency is an event that must be addressed quickly to avoid more serious consequences. Examples: a gas leak, broken power lines on the ground, a heart attack, a localized fire, a nasty road accident, etc. A disaster is a catastrophic event that exceeds the ability of the community to cope. "Community" can be small, as a household; or large like a region or a country. The important distinction is that responding to a disaster requires help from OUTSIDE the affected area. The lava flow in Hawaii is a disaster ONLY if Hawaii can't handle the situation on its own. Hurricanes, like Andrew, Katrina, and Sandy, created disasters because victims in the affected areas required outside help. A point to keep in mind is that, in a disaster, local responders (including hams), may be as affected by the disaster as everyone else in their community and, therefore, will not be able to respond. Broadband-Hamnet has announced a new firmware release, the most recent in a series of advancements that build on the Ubiquiti firmware released for the 2.4 GHz and 5.8 GHz amateur bands earlier this year. With this BBHN 3.0.0 release, Broadband-Hamnet now includes the Ubiquiti M9-series airMAX devices, giving hams use of the 900 MHz band for mesh networking. Here is a great set of tips from the St. Louis (Missouri) Metro ARES/RACES Group, with the permission and courtesy of EC Steve Wooten, KC0QMU, and AEC for Operations Gary Hoffman, KB0H. Tactical call signs such as "Shelter 5", "Net Control", and "EOC" are descriptive and give immediate information. They can be very useful during planned events and during emergencies. Do not, however, forget to include your FCC call sign at ten minutes intervals and at the end of each contact. Do not alter a message, even to correct a typographical error. What you think is right may actually be wrong. Moreover, any change you make might subtly alter the meaning of the message. Send or write it exactly as you receive it. VOX stands for voice activated transmitter. VOX devices are handy gadgets, but should not be used in an emergency setting. Ambient noise might activate the transmitter and tie up the frequency. Also, you do not want your casual comments to go out over the air. You brought your radio to the emergency, but will you be able to power it? Antenna connectors are fairly generic, but what about power connections? ARES groups around the country use Anderson Powerpoles as the standard power connector on their equipment. Be sure that every piece of your equipment is marked with at least your name and call sign. After the emergency, you'll want any property you left behind to find its way back to you. It's always a good idea to have a set of headphones around, but it may be an absolute necessity in an emergency. You may be placed in an area where other operators are working on different bands, you may be out in the open, or you may even be in the middle of a noisy shelter. A headset should be a vital part your equipment. You can't communicate if you can't hear. Is no one responding on the secondary frequency? See the complete list of excellent tips on the St. Louis Metro ARES/RACES website.